Discussion in 'JK Handmade Knives' started by JK Knives, Sep 5, 2018. A Tin Knife is a knife that fits in an Altoids Tin. If anyone has a custom design they would like made I’m open to doing it. The only restrictions are no taller than 1” and it will be made from 1/8” O1 steel, and must fit in an Altoids Tin. I would also be willing to make customer designed PSK Knives. Extremely bored at work. One finger grip where the handle wraps around the pointer finger. The trailing point blade provides a comfortable contour to rest the thumb, if you need to apply a bit of pressure. 3.25"x1" total. The marks in the first drawing are at 1/2". As you can see, I originally had drawn a hard 90* at the blade edge, but this would a) be uncomfortable and b) create a stress riser. Now, I don't think you can put enough stress on ~1.75", 1/8" piece of O1 to cause a crack at that point, but it might cause issues in heat treat. Fun activity, John! Thanks for entertaining me for a few minutes. Looks like a mini Persian style. Absolutely. I find that the Persian style trailing point works well on small Fixed blades because of the added edge length in relation to the overall length of the blade. 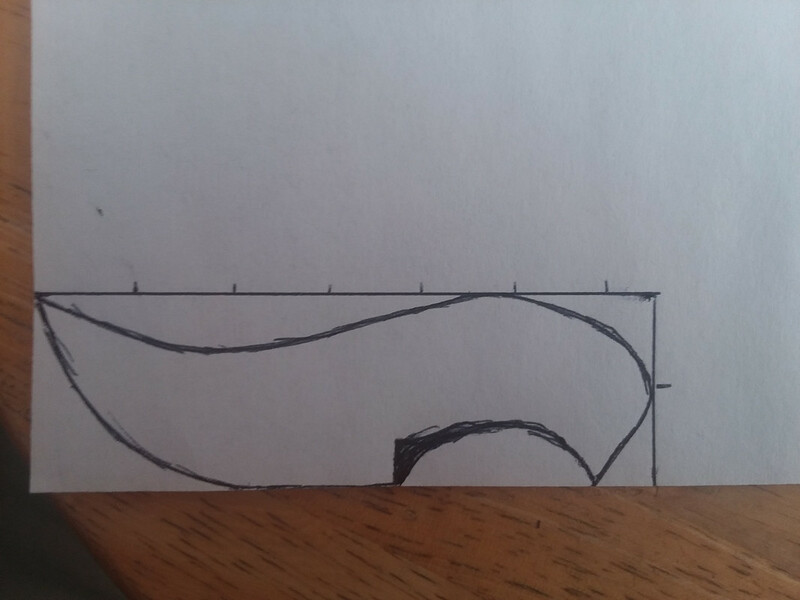 Tip-to-heel measured with a straight ruler is approx. 1.75", but measured with a fabric tape, it's closer to 2.25". That extra half-inch over, say, a wharncliffe or Spear point can mean a lot when you're talking about such a diminutive amount of real estate. 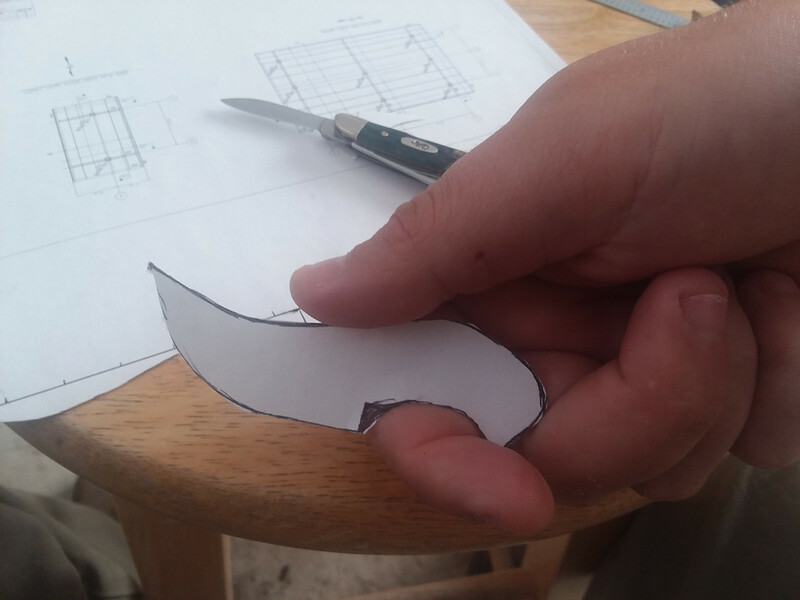 When I was originally drawing up the Pocket Chef, I drew it with a slight trailing point that actually gave an extra 1/2-1/3" extra edge length, but I couldn't fit it properly for the dimensions of your steel. Now that I have my Pocket Chef in-hand, though, I realize that the straight-back 4" blades offers way more edge length than I could ever use. I like tin knives but already own quite a few. Is it cost prohibitive to get O1 taller than 1"? One "knife" that is always with me is my Microtech Assailant. To some it may appear gimmicky but mine sees a fair amount of use, mostly opening beverages and the occasional package. I can go taller than 1”, but it does cost more. I make several models out of 1 1/4” steel.